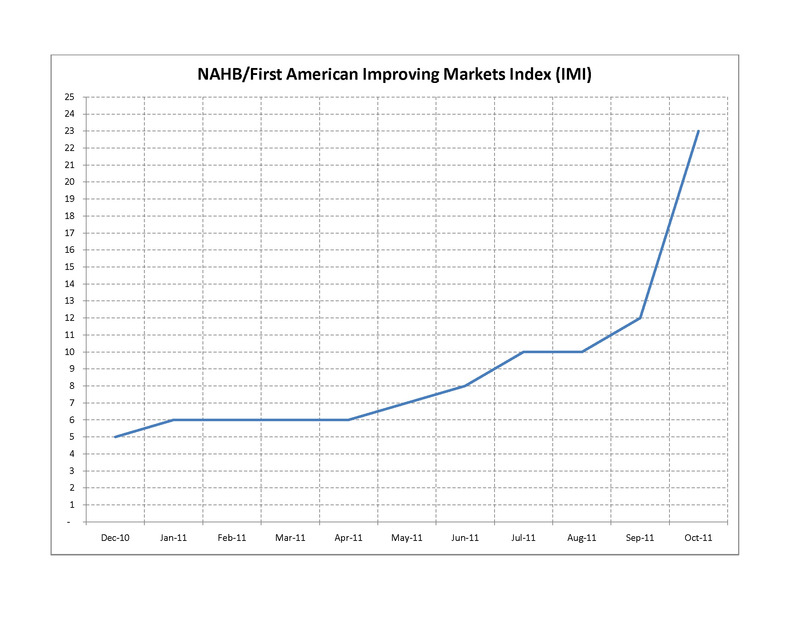 The second release of the NAHB/First American Improving Markets Index for October shows nearly a doubling in the number of metropolitan areas judged to be improving. The inaugural release in September showed 12 metro areas on the list and the October release adds 12 more metro areas and drops one (Bangor, Maine) for a new IMI level of 23. The IMI demonstrates that not all markets follow the national averages, and that there is some movement out of the recession and housing slump in places where jobs are being added, home construction is off the bottom and house prices have begun to improve. These three elements are the variables used to construct the IMI each month. 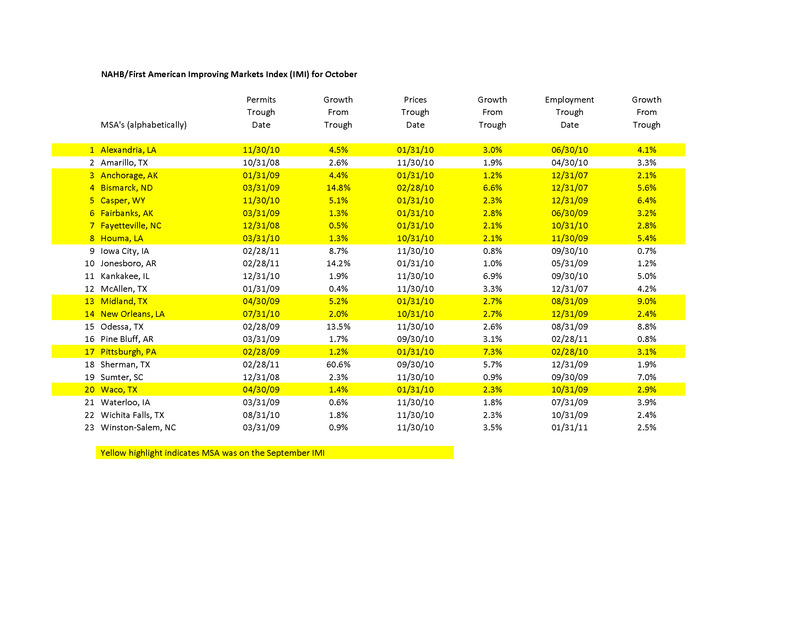 In order to make the list, a metropolitan area must see at least a six month improvement from a recent trough in single-family housing permits (as measured by the US Census Bureau), employment (as measured by the US Bureau of Labor Statistics) and home prices (as measured by Freddie Mac). The metro areas on the list are shown below along with the dates of the recent trough and the advancement since that time. One-third of the areas listed are in Texas and three are in Louisiana reflecting the benefit of energy production and refining. Four states (Arkansas, Alaska, Iowa and North Carolina) each have two metro areas on the list. The remaining five are distributed across the country. There are no places west of the Rockies on the list and all but two are small MSAs. The universe of potential candidates comes from the roughly 360 metropolitan statistical areas (MSA) as defined by the Office of Management and Budget. Submarkets within MSAs could also be recovering but there is insufficient data at a level lower than MSA to make that determination. The IMI simply makes the point that there can be places above average when the national average remains stalled.